HomeSilence is a Writer’s Friend. You may look at this quote as Mother Teresa apparently intended it or you may take it a step further, as you may with a great many spiritual sayings and scripture. I’m taking it a step further for writers today. There are times when you are writing and chaos is around you. That chaos might end up in your writing of a scene that requires a delicate touch. In silence I am able to quietly and calmly sink myself into a character, become a character, and bring out the inner heart, the soul of that character. I close my eyes and type. Errors in spelling don’t bother me at this point. I type what my mind sees and what my heart feels during this silence. Those moments where I am successful at this I have found to be the ones beta readers connect with most. Or readers of certain poems connect with. We see a great deal of advice about listening to music while writing, and at times I do like to create a mood with a play list. But my most successful moments are when I listen to the silence in my heart and mind and simply type. Silence is my friend, and one of the best I have. And that silence isn’t just for writing, it’s for life. We need that time to give our minds, our emotions, and our bodies an chance to rest and heal. For more#BeWoW articles, check the comments possible links and ping backs or Twitter for the hashtag. For more Writer’s Quote Wednesday articles, visit Colleen Chesebro at SilverThreading.com for her post sometime today. ← #BeWoW & Writer’s Quote Wednesday are Tomorrow. Get Ready! I agree with the silence whether writing or not. I used to watch tv and write or read at the same time and it just became too interruptive. I prefer silence now. “Silence is golden” as the Tremeloes sing. This is a marvelous post. I didn’t realize we share the same faith, so we are sister and brother In Christ; and I didn’t know about Grade 3 Concussion–which sounds horrendous, for all that chatter (my mind chatter is not identical to yours, as I do sleep–but I don’t often feel my conscious mind at rest). To feel my heart resting in the Lord is a blissful comfort, and I suppose much of my writing must have seeds there–perhaps those are the poetry works that do touch another’s soul; I’m not very aware of it all. God bless you most abundantly. 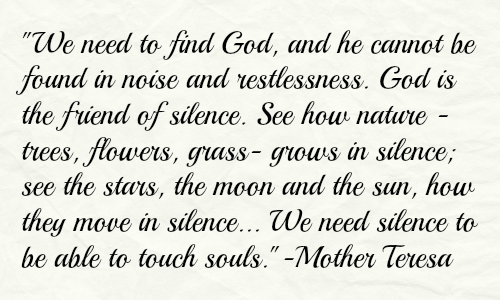 Finding silence can be hard. I don’t have your issues but do have. To put up with the noise of family life fortunately I’m good at blanking it out. Silence when found, embrace it. Indeed.